If you update VCSA (vCenter or PSC) 6.0 U1 using VAMI (patching directly from internet or using local repository/mounted iso), the update may hang at 70%. If you face this problem, you need to check the update log /var/log/vmware/applmgmt/software-packages.log on VCSA (using SSH) and find a line similar: “UpdateTask: status=completed, percent=100”. 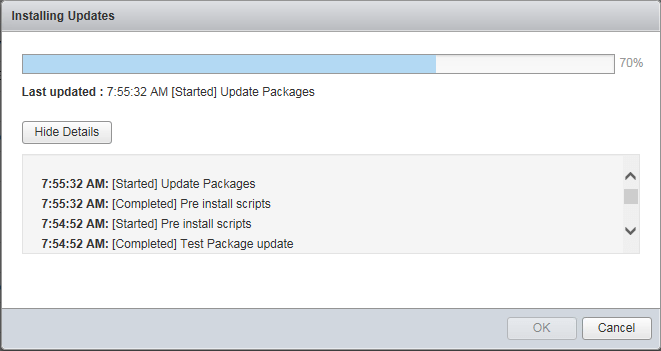 It means the update is completed and you can reboot the VCSA. If it’s complete your safe to reboot.. if you went cowboy and thought it was broken.. then you broke it by prematurely rebooting it. With a upgrade via SSH this issue does not happen..